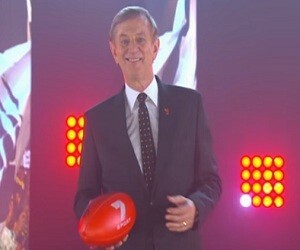 AAMI and Channel 7 pulled together some of their favourite comments made by Dennis Cometti, one the most iconic voices in AFL history, in a 30 second TV commercial, in order to congratulate him on his forty years in the commentary box. librarian” and of course, “That was centimetre perfect”, has been released with the title “Thank You, Dennis Cometti”, as the veteran commentator will retire after this year’s season. The ad ends with an old photo of Commetti and the onscreen lines “Australia says Thank you, Dennis All the best!”. The track playing in the background is Brenda Lee’s “Danke Shoen”, from the 1964 album “By Request”.